It is widely accepted that Tarot cards developed in Italy in the 15th century. They sprang out of the playing card tradition and the first engraved images, known as the Tarocci, were initially attributed to the Renaissance master Andrea Mantegna. 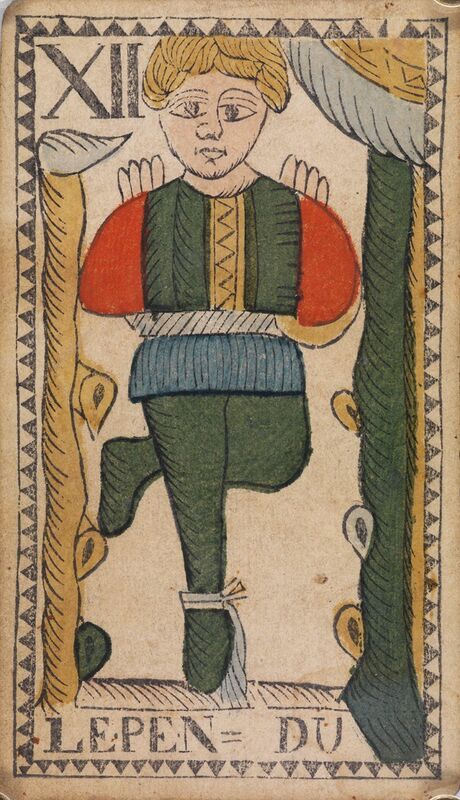 However, the artists of these first tarot are unknown, and following their first appearance, further artists quickly began to create new versions of this appealing game. Tarot imagery was a reflection of human experience, or a journey of the soul, and it is not until the 18th century that the cards became the tools for fortune-telling and occultism. Included within the deck are the Major Arcana or trump cards, and these picture cards are the recognisable archetypes. After tarots became standardised, these 22 cards were numbered, so that number 12 becomes the Hanged Man. This is not an auspicious card to draw, for he represents betrayal and is a symbol for the traitor. He is depicted hanging by one foot from the gallows, as traitors in Renaissance Italy were likewise branded. [1.] This shady character, and his companion, have now infiltrated into the Baillieu Library Print Collection. Like many printed cards, this is a hand-crafted woodcut and the colour has been applied with a brush and stencil, yet there is something about this subject that appears even more unsettling to the viewer. It is that this Hanged Man has been inverted; he is hanging the wrong way around. The Hanged Man is the subject of much speculation by occultists, and this inversion invites even more conjecture. Auguring aside, it is the chief clue which allows this card to be traced to the Belgian Tarot. Before arriving in Belgium, the Tarot was introduced to the French at the conquest of Milan and Piedmont in 1499. 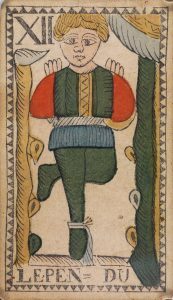 This encounter produced the Tarot of Marseilles, a term which refers to tarots produced in Marseilles and which are recognisable by their standard pattern. 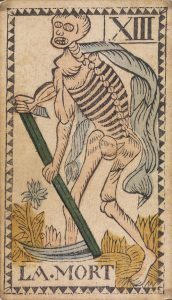 The history and linage of a symbol may be complex, as in the case of the Belgian Hanged Man, which appears to derive from Jacques Viéville’s version of the Tarot of Marseilles; a pack with a dubious heritage. 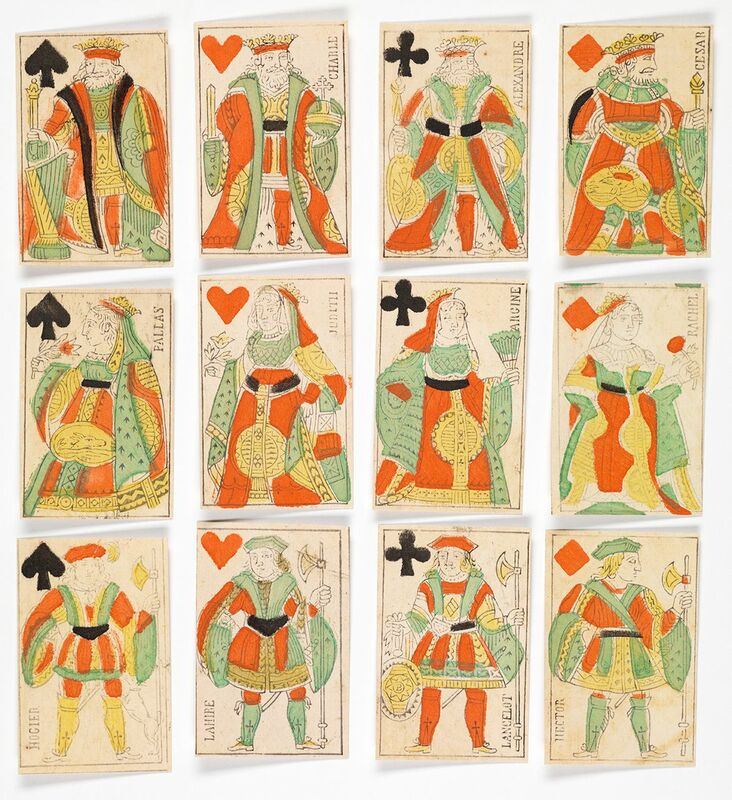 It is likely that Viéville (a pseudonym) copied this set from a sheet of printed cards, as the authorities would plane the images off woodblocks to prevent smuggling and tax evasion on the cards, and thus the images in this deck are in reverse. [2.] The rather obscure Belgian paper trader Pierre-Antoine Keusters would have seen this version when he produced a similar deck containing these two cards. 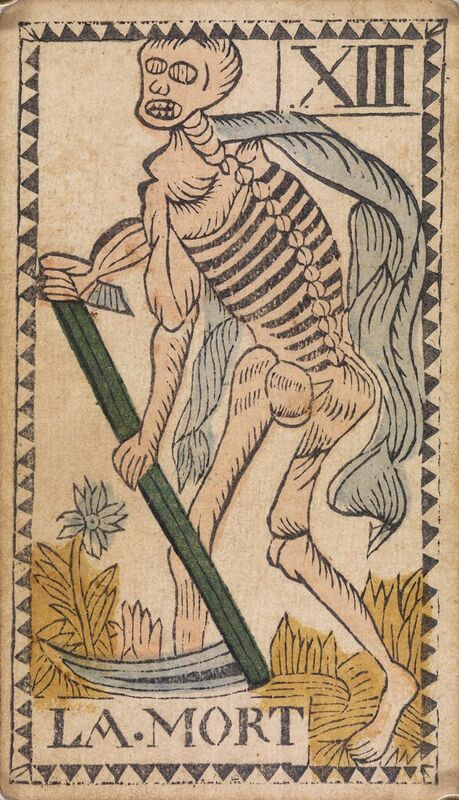 In the company of the Hanged Man is card number 13, or Death, a symbol which requires no explanation. This fearful card, again imaged backwards, has also entered the collection. With an innocent beginning, the Tarot altered its imagery and its eerie meanings through the passage of time. With the arrival at the Belgian Tarot and its somewhat disreputable heritage, we find a pack of rouges, as much as a transfixing work of art. writes Louise Dyer in an article on Rose Adler. 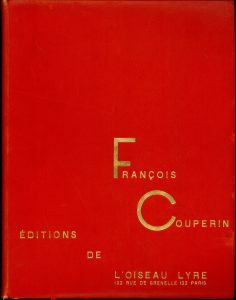 This statement on culture and beauty echoes the life work of Dyer and her publishing label l’Oiseau-Lyre and was first made tangible with François Couperin Oeuvres Complètes, a limited collected edition published on the 200th anniversary of the death of Francois Couperin Le Grand in 1933. On 18 & 19 May a symposium celebrating the 350th Anniversary of Couperin’s birth and Dyer’s achievements will celebrate this seminal creation. Here I shed light on Dyer’s literary aspirations. Along-side her publishing goal of producing rare music Dyer was an avid supporter of Australian writers promoting them beyond the shores of Australia; an initial goal was to have Australian authors translated into French. She was a member of Amis du Livre Français, the Authors and Editors of France and significantly Les Cent Une. The latter was a group of feminists publishing a book each year, the first being Giradoux’s Suzanne et la Pacifique (1927) sumptuously bound by Rose Adler. Dyer also wrote, penning essays on cultural subjects, which, as an attempt to bridge the cultural and distance gap, she sent back to Australia to the Melbourne Herald newspaper, one a series Impressions of France. During her life she formed close working relationships with writers, such as Joyce, Duhamel and Innes just to name a few. Dyer was a Francophile but at heart she was still Australian. 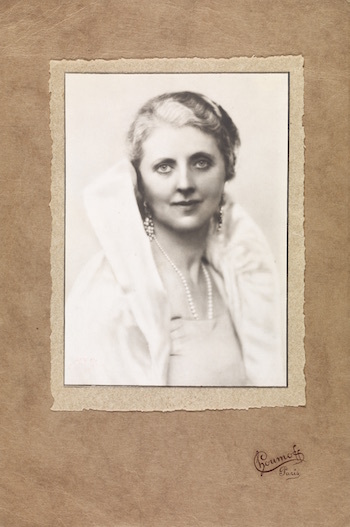 Evidence of this was her return to Melbourne on 11 January 1932, to support her unmarried brother, Gengoult Smith, who had been elected Lord Mayor, as his Lady Mayoress. During this trip she was invited to present a paper to the Australian Literature Society (ALS). She suggested that she should speak on the ways Australian authors might be promoted internationally. To that end a committee was set up to suggest a list of suitable works. Dyer returned to Paris and began liaising with French publishers. However, reservations were expressed by several authors on the list when told that adaptations rather than direct translations were being considered by the French publishers. 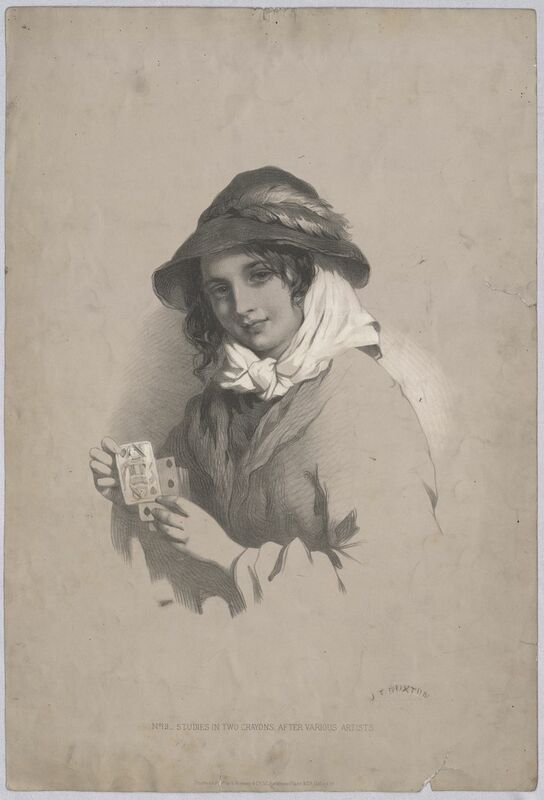 Kate Baker, copyright holder to Furphy’s Such Is Life thought the French would appreciate its ‘literary flavour’, but when cuts were suggested, Baker lost interest, and no further correspondence was received. Barnard Eldershaw (Marjorie Barnard) author of A House is Built was also “rather adverse to there being any cutting or adaptation of” her work. Miles Franklin was concerned that Aussie slang may not translate well! This set-back didn’t deter a tenacious Dyer. Another opportunity to proceed came alongside the Centenary Celebrations for Melbourne for 1933/34. A perfect opportunity to consider a literary competition, Dyer foresaw the winner having their novel translated into French, therefore promoting Australian literature to the world. In a letter to Major Condor of the Celebrations Committee (7 April 1933) Dyer explicated her instructions for the competition – importantly there should be a woman amongst the judging panel. Dyer offered a prize of £200 for the winning novel and prizes for poetry and a short story. Regrettably the competition became farcical and strains of nepotism were evident. Vance Palmer was expected to win first prize for his novel, The Swayne Family, but his wife Nettie was an acquaintance of Dyer’s from her Presbyterian Ladies College (PLC) days. In the event, and much to his chagrin, he had to share with F.S. Hibble’s Karangi; he did, however, win the short story section. In an obvious conflict of interest, Frank Wilmot (Furnley Maurice), who had been on the novel judging panel won the poetry prize for “Melbourne and Memory”, one of his Melbourne Odes. 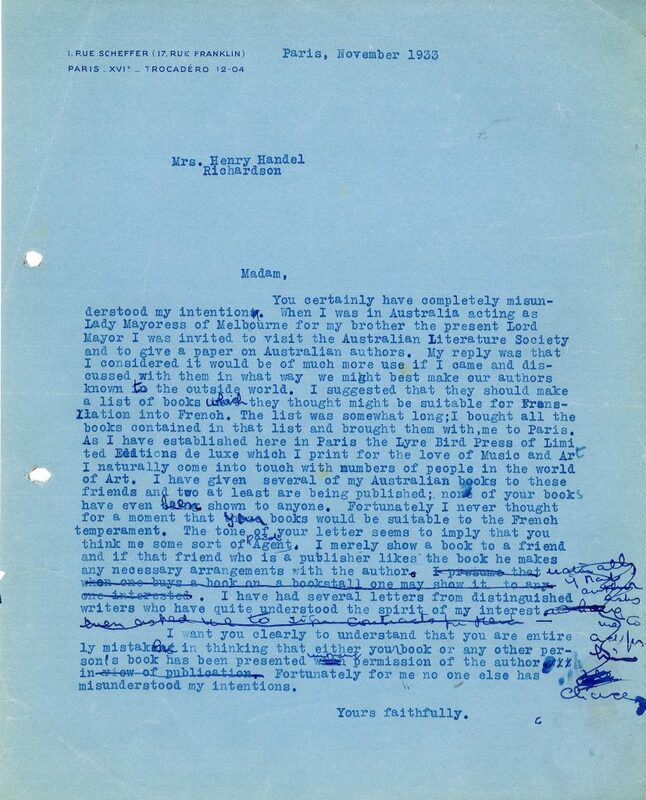 Dyer was very disappointed that none of the works could be unequivocally promoted as ‘the Australian novel of the hour’ – we can only ponder what Dyer had in mind as an exemplar. Translations into French and publications never eventuated. This outburst might have been an understandable response but is at odds when we consider that they shared ideas about promoting Australian ‘culture’ to an international audience. 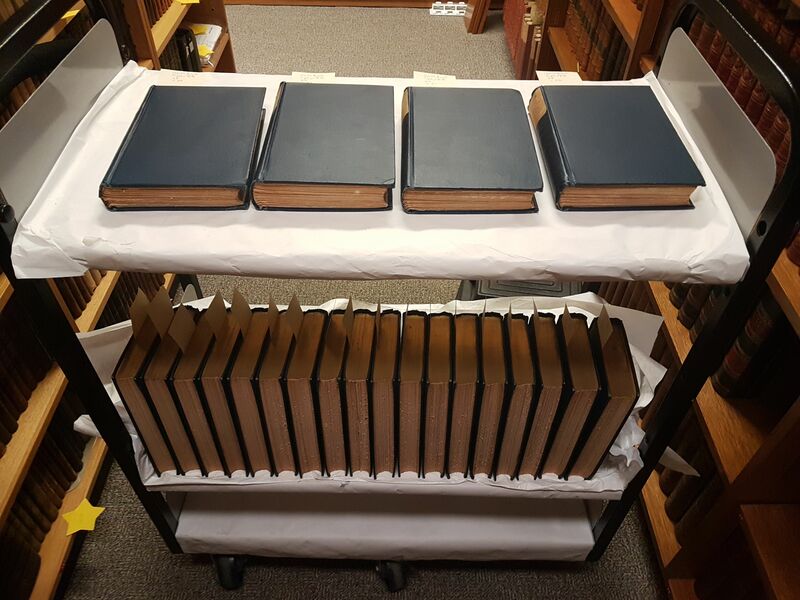 HHR stated in an interview with the West Australian newspaper, “I always wanted to do something for Australia.” In 1930 HHR was awarded the ALS medal for best Australian Novel of 1929 Ultima Thule. With obvious commonalities it is unfortunate that HHR had asked for much of her correspondence be destroyed after her death. She “…. dreads curiosity about one’s personal life”, writes Palmer in The Australian Women’s Weekly, when interviewed on her biography of HHR; ironically conjecture can thrive where proof cannot be found. These back-hand affirmations are part of the psychology of the Australian habit of the Tall Poppy Syndrome, perhaps. The PLC network had the ability of promoting Australians publicly but alongside insidious elements of cutting individuals down with scathing comments and self-deprecation. The contradictory mood is summed up by Kernot “It would be a triumph for this country. But alas we are like the ants, a little folk.” Dyer dismissed this prognosis through her actions and dissolved the distance between an historical Europe (culture) and a colonial outpost (culturally bereft) by feasting on the symbiotic relationship between poetry and music. Australian Women’s Weekly (9 September 1950 p. 18). Chanin, Eileen and Miller, Steven “The Patron Louise Dyer (1884-1962)” in Awakening: Four Lives in Art (Wakefield Press 2015). Davidson, Jim. Lyrebird Rising: Louise Hanson-Dyer of Oiseau-Lyre 1884-1962 (Melbourne University Press at The Miegunyah Press 1994). Probyn, Clive & Steele, Bruce. The Letters Volume 2 [1917 – 1933] (Miegunyah Press 2000). 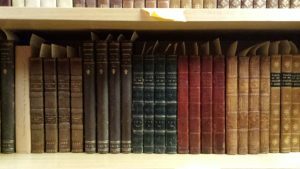 Editions de l’Oiseau-Lyre Archive (Rare Music, Special Collections): 2016.0035.00220; 2016.0048.0002; 2016.0048.00011. West Australian “Interview with HHR” (21 March 1931 p. 4). 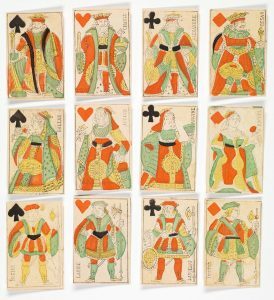 More than merely children’s toys, playing cards have a long and fascinating history. 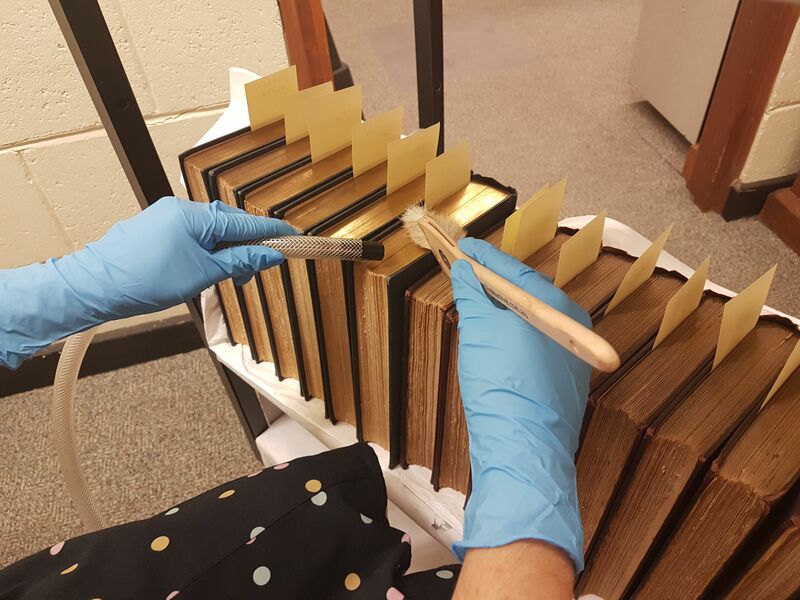 In printmaking, they represent some of the earliest examples of the media as they were first hand-made in Europe in the 15th century (see Printing 1450-1520). They were typically printed from woodcut on a large sheet, with a patterned backing glued to the verso, and would later be cut into individual cards. Additionally, they show the technical development of the art through the application of colour with stencil. Surprisingly, they also convey a world of information about art and society, and are a record of social exchange. Their designs hold many messages and can often be traced to a specific time and location. 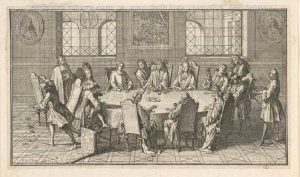 Playing card games transcended social classes as they were played by aristocrats and peasants alike. They have the power to evoke strong emotions via the thrall of the game and the consequences of chance and fortune. As material objects, cards record insights about human interaction and moments in history: they could be exchanged, written on and their meanings transformed. 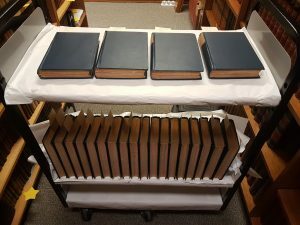 A set of 32 piquet cards has been added to the Baillieu Library Print Collection. Piquet is a trick-taking game rather like euchre which uses 32 cards instead of the regular 52 deck. The set of cards was acquired to provide students of printmaking studies a practical example of the use and application of colour with stencil, but they are also of interest to students of history and psychology. 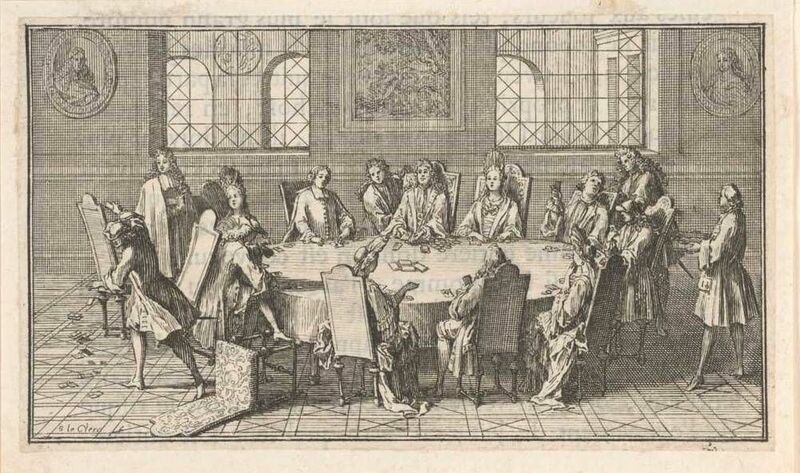 France has an important role in the development of playing cards and their suits of trèfles (clovers or clubs), carreaux (tiles or diamonds), cœurs (hearts) and piques (pikes or spades) were adopted by many other nations. Originally these suits symbolised positions of the church, later they represented roles at the royal court. In 1813 Gatteaux rethought the design and produced another deck, and this time the face cards returned to a more traditional Paris pattern which can be seen in the Baillieu’s deck of cards. Gatteaux’s design had a brief life before it too was replaced by the double-headed face cards, typically seen on playing cards today. 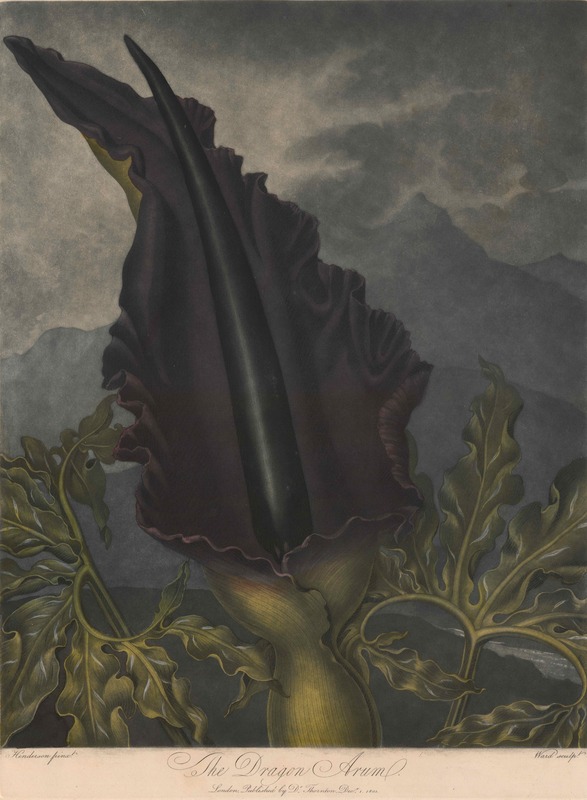 The Dragon Arum or Dracunculus vulgaris (1801), a striking mezzotint illustration, was added to the collection by Rare Books in 2017 and is currently on prominent display in Dark imaginings: tales of gothic wonder. Also on display is a facsimile edition Robert Thornton’s book, Temple of Flora (1799) where this menacing lily originates. When the botanist Carl Linnaeus developed a system of taxonomy and began to discuss plants in terms of their sexuality, then nature became animated and the academy became enlightened. 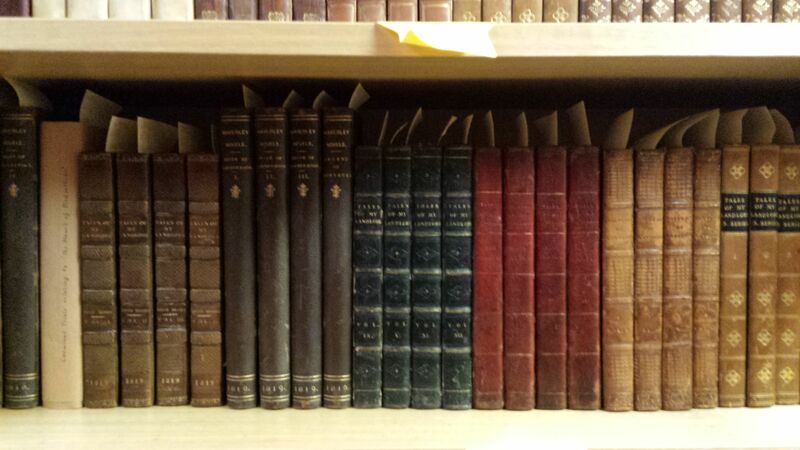 These ideas are rapturously embodied through Thornton’s book, which lavishly illustrates this new, romantic nature. The Dragon Arum is a dangerous bloom designed to lure insects into its maw of death. As a mezzotint, it layers the versatility of the medium through the introduction of colour, and by placing the specimen before a heaving backdrop from the natural world.